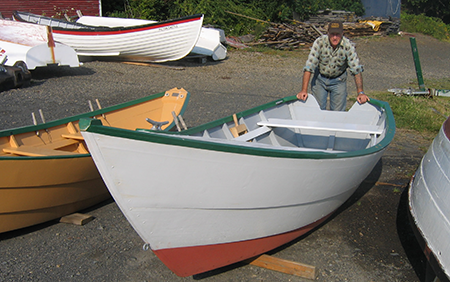 Exactly like a dory but with a broad transom on which to hang an outboard motor, the Transom Dory Skiff is a sturdy little boat, strongly built with double the number of frames and heavy oak knees on the transom. We often deck-over the bow to give these boats a vintage feel. Custom seating is another option.